By coincidence, we watched Barbara Walters’ absurd “documentary” about heaven two days after watching the 1982 comedy Kiss Me Goodbye. The Walters program didn’t refer to that film, but it did include clips from Ghost and other entertainment properties that alluded in some way to life after death. 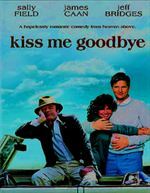 In Kiss Me Goodbye, the person who has managed to live on after his physical death is a Broadway musical star and choreographer named Jolly (James Caan) who expired after he fell down a staircase during a party in his Manhattan home. As the film opens, Jolly’s widow, Kay (Sally Field), is about to move back into the house after having abandoned it for several years. Kay is engaged to Rupert (Jeff Bridges), a moderately conservative man, and she wants to begin the marriage in the stylish digs. Her plans are disrupted when she discovers that Jolly’s ghost inhabits the place and claims that he wants to reestablish their relationship. Kate’s erratic behavior worries and confuses Rupert and the others in her circle, and eventually she worries them even more by telling them about her encounters with Jolly. Rupert, who is already jealous of the attention Kate gets from Jolly’s former colleagues, is upset by her ghost stories, but not enough to leave her. Instead, he pretends that he, too, can see Jolly and suggests that the three of them take a trip in the country together. The result, of course, is chaos. The key to the story is found in Jolly’s real reason for manifesting himself to Kate — and the reason is not what he claims and not what may seem obvious. This is light fare, something on the order of milkweed spores. A story that barely stands on its own isn’t helped by some excessively broad comedy, including a particularly annoying bit of slapstick about exorcising a spirit from a dog. I read in what I admit is not an authoritative source that James Caan disliked this movie, took the part for the money, and considered the time he spent making the film one of the worst periods of his life — probably an exaggeration unless he’s had an especially charmed existence. Still, his soave, self-assured character provides by far the most fun in the film. 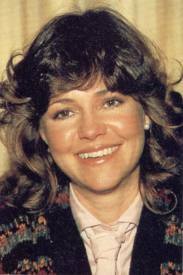 Sally Field was nominated for a Golden Globe as best actress in a comedy, which makes sense, I suppose, because she was, as usual, playing herself, something she should be good at after so much practice. Kiss Me Goodbye is a remake of Dona Flors e Seus Dois Maridos, a 1976 Brazilian film which, in turn, was based on a 1966 novel, by the same name, written by Jorge Amado. Kiss Me Goodbye was the last theatrical movie made by the distinguished actress Claire Trevor, who appears as Kay’s meddling mother, Charlotte.